So it’s been almost 3 weeks since I made my last post, but not without good reason! Of course the holidays have a way of absorbing up all of your free time, but that’s not the real excuse. I’m sure that by looking around this page a bit (at least if you’re familiar with my blog from before) you can notice that I have a new awesome site design! For Christmas my boyfriend began this project as one of his gifts to me and when I saw the preview of what was in store by the time it was done, I nearly exploded with excitement. He put a ton of his free time into seeing it through and I couldn’t be happier with the result. Once I realized the new design was incoming I really wanted to wait to make a new post. I have a few more recipes lined up as a result of the mini hiatus (including roasted cauliflower soup and limoncello), but I knew that my first post of 2014 had to be something healthy. This is, after all, the one time of the year that the human race unanimously decides to improve their well being (at least for a couple of weeks until someone caves and shows up at the office with donuts). A while back someone commented on how much they enjoyed looking through my blog. She pointed out that she particularly loved the Mediterranean influence she often sees in my recipes. I thought, “Wow… I guess I do have a tendency to cook with lemon, chickpeas, parsley, etc…” And who wouldn’t? The fresh flavors so commonly associated with Mediterranean food are incredible. This salad brings some of those influences together into one filling dish for under 350 calories. There is protein. There is fiber. There is nutrient dense broccoli. It’s definitely a recipe to ring in the new year and kick start your healthier eating habits. A quick, healthy lunch inspired by the fresh flavors in Mediterranean cooking. Prepare grain according to package instructions. In my case I just popped it in the microwave for about 2 minutes. 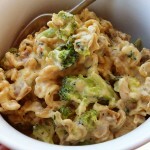 Place broccoli in a bowl and microwave a couple of minutes until no longer raw, but still crunchy and green. I combined my broccoli with the grain to save time while heating. Whisk together olive oil, lemon, water, and spices to form the dressing. 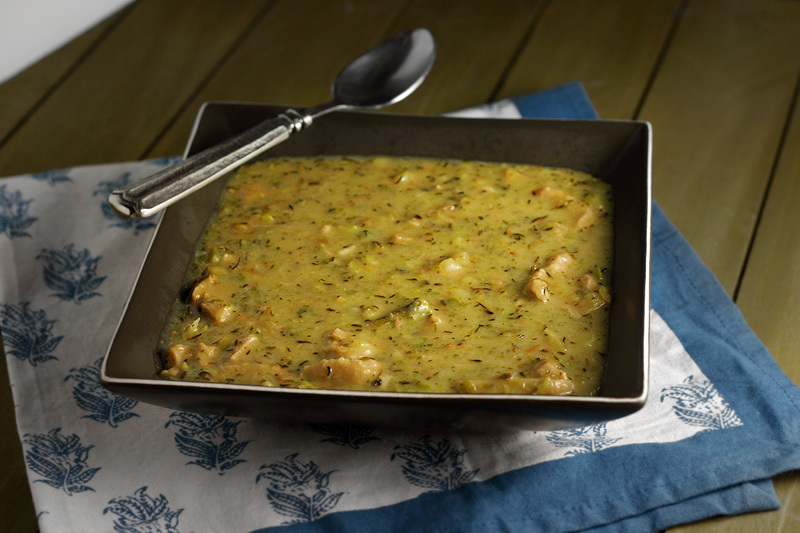 Combine all ingredients with the dressing in a large bowl and toss well to combine. Eat slightly warm as is or transfer to the refrigerator for about 15-20 minutes first (my preference). I don’t think there are many people out there that don’t enjoy a warm, hearty bowl of potato soup… but when you add cheese and broccoli to it? Pretty much heaven in each bite. 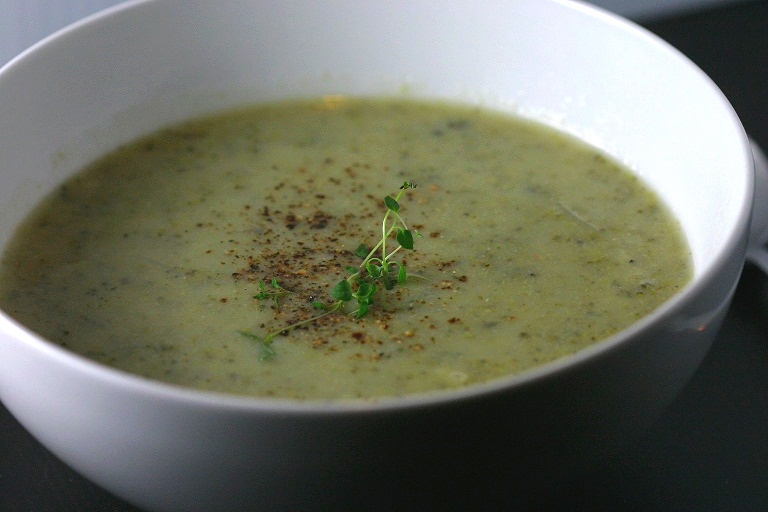 Recipes for this type of soup are a dime a dozen, and I even make it multiple ways myself. 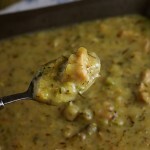 What I think sets this particular soup apart is both the roasting of the vegetables and the use of a delicious smoked Gouda in place of the more traditional cheddar. I’ve had a few people recently tell me that I should update my blog more often. I try to get at least one recipe up a week, but I want to take this advice to heart and get into the habit of posting more often. I actually have a backlog of another 4-5 recipes that I’m waiting to write about; I just need to get it done. For the past couple of weeks my mind has been somewhat preoccupied with the creation of my Halloween costume. I love the art of transforming myself into someone new for a few hours so I’m kiiiiind of a costume junkie. For the past three years I’ve been in California for BlizzCon (yeah, I’m a World of Warcraft nerd – wanna fight about it??) 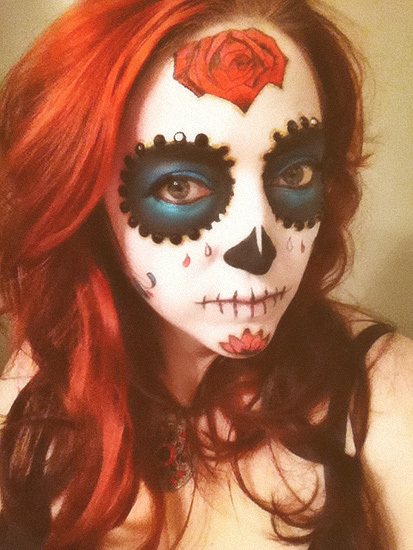 and for that reason I have really missed dressing up for Halloween. 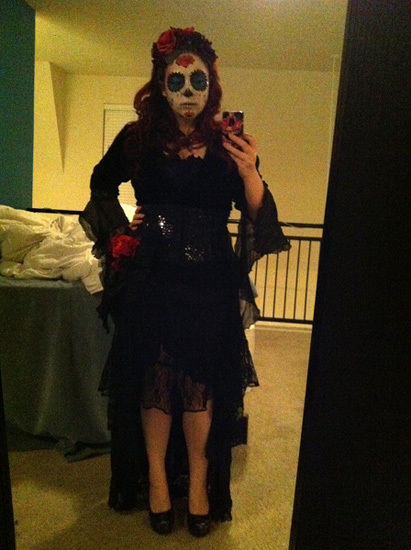 This year I opted to do a Dia de los Muertos themed costume and put a fair amount of thought and time into crafting the dress and practicing the makeup. In the end I’m really happy with how it turned out! 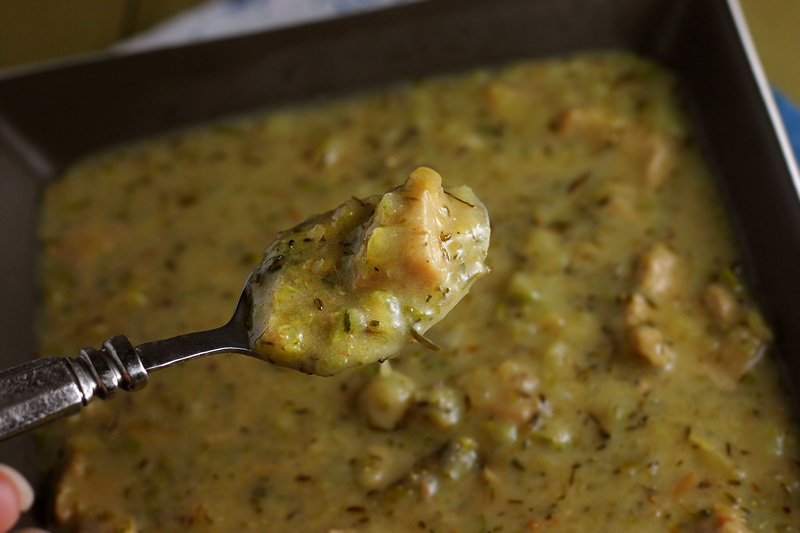 Now that I’ve finished my costume, attended the party, and gotten all of that out of my system I’m ready to forge full steam ahead on the blog again – starting with this super yummy soup! And considering this soup is a meal in a bowl, it is pretty reasonable at 400 calories per serving. This particular time that I made it I decided I wanted to bump up the protein and include the addition of seitan. For you non-veggie folks out there, this is just a non-soy alternative to chicken for us vegetarians. You can leave the protein out (I actually prefer it that way) or opt to use some chopped leftover chicken or crumbled bacon if you like. I’ve yet to make a vegan alternative to this, but I actually think using nutritional yeast and a bit of the hickory flavored bacon salt would be an awesome substitution for the smoked Gouda – just make sure to use a little more liquid to compensate for the thickness that the nutritional yeast would add. A chunky potato soup with flecks of roasted broccolini and smoky gouda cheese. Toss chopped broccolini and potatoes with half of olive oil and distribute evenly on a cookie sheet. Roast for about 20 minutes. Meanwhile heat the other half of the olive oil in a pot big enough for your soup. Add chopped seitan and garlic, cooking until the seitan is lightly browned. Add stock and roasted vegetables. Bring to a simmer and reduce heat. Let cook, covered, for approximately 10 minutes. 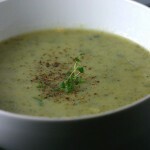 Using an immersion blender partially blend the soup. Little bits of potato and broccolini are ok, it doesn’t need to be perfectly smooth. Stir in the smoked Gouda until melted and then add the cooked seitan and garlic. Season liberally with black pepper. A while back I bought a really nice rice cooker. It set us back enough that I was determined to get more use out of it than just making the occasional pot of rice. For months I made as many things as I could in the rice cooker, and this was one of the easier (and lighter) recipes from that time. There is no reason you can’t do this on the stove top though! I originally made this soup at 4 servings, but my boyfriend and I ending up splitting the whole thing. If you serve it between 4 people it’s only about 100 calories per bowl (which is why it’s so easy to have two). Dump everything but the cream cheese into the rice cooker and start it. You can see the process for making this soup is going to be very complicated! When the vegetables are soft, either use an immersion blender (careful not to scratch up your rice cooker!) or transfer the soup to a food processor to puree. Stir in the cream cheese until it’s melted throughout. Salt and pepper to your liking. You can use 4 cups of stock in place of the water/bouillon. You can also use fresh herbs in place of the dried, but you’ll want to up the teaspoons to tablespoons. I made this sauce one afternoon when I was craving alfredo, but knew I couldn’t spare the calories. This cheesy sauce has a bit of richness from the heavy cream, but the other key ingredients keep the fat content manageable. As if that wasn’t reason enough to make it, you create the sauce in your food processor in just a few seconds. If you don’t have a food processor you can work the ingredients together with a fork, but make sure your basil is finely chopped as you won’t have the food processor to do the work for you. 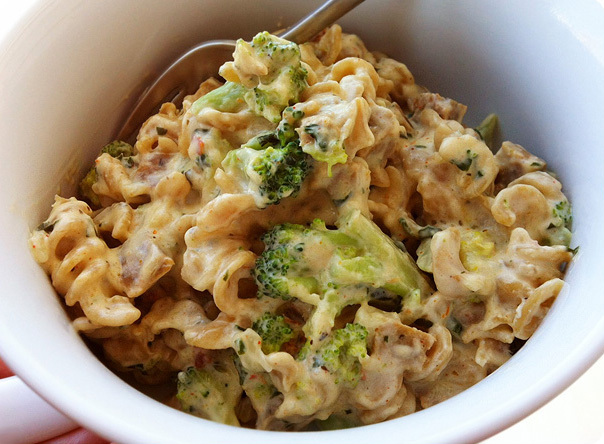 Lightened up cream sauce with sausage & broccoli that whips up in seconds. Blend all sauce ingredients in a food processor until smooth. Bring pasta to a boil. 2 or 3 minutes before the pasta is fully cooked, put the broccoli into the pot to cook. Strain the pasta and broccoli and return it to the pot. Add sauce and vegetarian sausage to the pot and mix well. Cook on low heat until warm, then add the parmesan and mix it in well. When the parmesan melts, it’s ready to serve. If you’re using non-vegetarian sausage, you should make sure it’s fully cooked. You can also replace the laughing cow wedges with plain cream cheese, but I happened to have several on hand and I enjoyed the extra flavor they added. 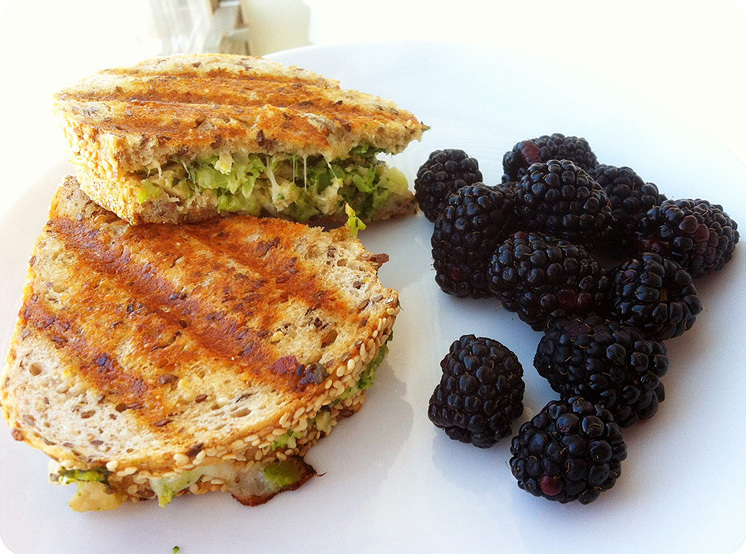 A panini with broccoli in it. A belly with panini in it. Pulse the quorn, broccoli, veganaise, parmesan, and any seasonings (I used garlic powder, salt, pepper, and cayenne) in a food processor until coarse, but not pasty. Butter each slice of bread. Assemble sandwiches by putting half of the broccoli mixture and half of the asadero on each one. 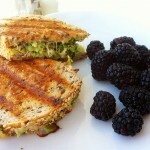 Grill on both sides or put in a panini press. Cut some calories by using one slice of bread and doing a grilled open faced sandwich. Lightly broil the cheese until nice and bubbly.